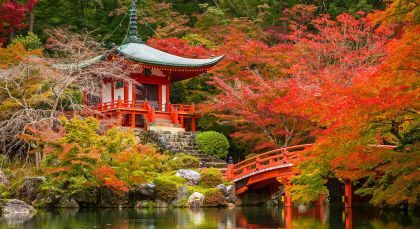 From hiking in iconic national parks and verdant highland valleys to lazing in your very own private Japanese onsen, visits to fairy tale villages in the countryside and tea ceremonies with geishas, this vacation is the perfect introduction to the traditions and lesser known treasures of Japan. 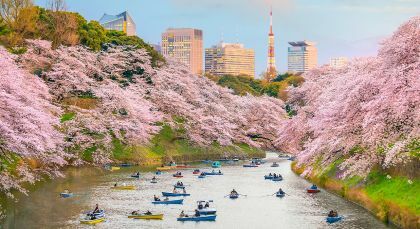 Tokyo is a city like no other! Defined by cutting-edge design, quirky creativity and its own unique ancient culture, the city defines the best of both worlds. Set out to explore the Hakone-Fuji National Park, a vast area encompassing Mt Fuji, Lake Ashinoko, and several other landmarks. The sheer variety of geographical features found in the area – including hot water springs, volcanic islands, lakes and mountainous areas – makes it a unique destination for travellers. Accompanied by a local guide, take the Romancecar express train at Tokyo’s Shinjuku Station to reach Hakone in 90 minutes. At the access point to the park, you could take the cable car up Mt Owakudani – said to be the world’s second longest cable car. Or you could use the so-called “pirate” ships that criss-cross Lake Ashinoko. Your third option would be to go on the Hakone Tozan “switchback” train through the mountains. Whichever you use, rest assured of witnessing some spectacular sights in this park full of nature’s marvels. (Full Day; Private Activity; Transfers by public transport; Fitness Level: Moderate). Hakone defines the iconic image of Japan— with the majestic backdrop of Mount Fujiyama as it rises out of coniferous forest covered mountainsides, lakes and hot springs (onsen). Take a trip to Mount Fuji National Park for Japan’s most iconic destination. Enjoy the numerous transport options to reach Mount Owakudani for the most breathtaking view of this majestic volcanic mountain peak. You could ride the world’s second longest cable car, passing over hot springs and simmering rivers of volcanic landscapes. As per local beliefs—you could add seven years to your life by eating Hakone’s famous hard boiled, smoked eggs that are cooked over the hot vapours! Take the Hakone Tozan ‘switchback train’ that winds its way through the mountains, offering amazing views of the surrounding highland valleys. 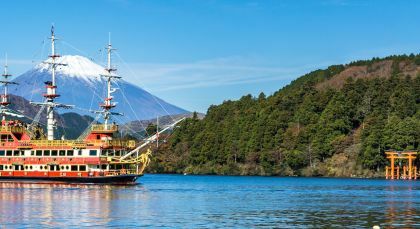 Or better still, ride a splendid replica of a pirate ship that will sweep you across the 3,000 year old, volcanic Lake Ashinoko, right up to the Moto-Hakone town. (Full Day, Fitness Level: Easy; Please bring warm clothing). When in Japan, you can hardly miss out on experiencing the traditional, hot spring water baths with their healing properties. Enjoy the complementary facility of taking an Onsen soak in your own private outdoor tub of natural hot spring waters. Feel all your stress melt away from your tired muscles. Make the best use of all the other traditional hot tub options available at the property, each bathtub with its own particular temperature and mineral combination. A sumptuous dinner, followed right after by a hot soak comes highly recommend by your hosts. As per tradition, these other hot tubs are gender-segregated, shared bath facilities. Located in the heart of the Japanese Alps, Takayama is an excellent option for those seeking a countryside jaunt. A gateway to the hiking paradise of mountainous Hida, Takayama is home to ancestral old homes, temples and shrines. Kanazawa is perhaps best known for its 17th century castle garden Kenroku-en. It is equally well known as the neighbor of the quintessential Japanese feudal fortress, Kanazawa Castle. Kyoto is to be seen to be believed. With no less than 17 UNESCO World Heritage sites, the city encapsulates traditional Japanese culture and tradition. 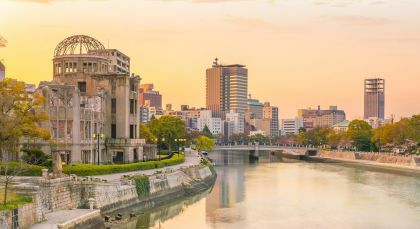 Revel in the traditional sights, smells and sounds of feudal Japan’s best preserved city, in the company of your local guide. Visit the many UNESCO World Heritage sites dotting Kyoto, beginning with the Kinkakuji Temple, originally built for the Shogun. At his request, the Shogun’s villa was converted into a Buddhist Temple after his death. Discover the magnificent 15th century Nijo Castle with its splendidly preserved medieval gardens from Japan’s Edo period. Admire the many details and typical architectural features of the old monument, before walking down to the bustling Nishiki Market. Eat your heart out at this food street payable on spot, also known as ‘Kyoto’s Kitchen’, lined with innumerable restaurants and traditional eating houses! Try out typical local delicacies such as pickles, dried fish and sushi. Also visit the beautiful Arashiyama bamboo grove. (Full Day; Private activity & Public transport; Duration: 8 hrs. Please wear comfortable walking shoes; Fitness level- Moderate; Food tasting to be paid by the guests on spot). 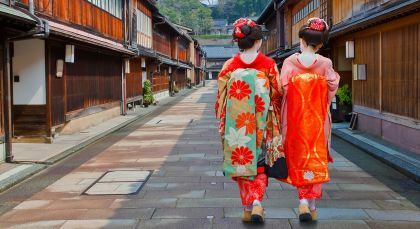 Explore the fascinating world of the traditional geishas in the company of Peter Macintosh, an academic and expert on geisha studies at the Kansai University. 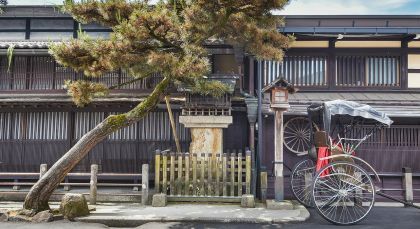 Take a walk through Kyoto’s old geisha districts with Peter, catching interesting bits of information on this almost dying art form of traditional Japanese entertainment. You may spot a geisha and her apprentice – a maiko – along the way. Peter takes you to a private and exclusive geisha ochaya teahouse and be your translator for your visit. Enjoy a cup of matcha green tea and traditional sweetmeats in the company of a genteel maiko or geisha in her graceful costume and customary makeup. Enjoy the pleasant flow of conversation, games and artistic entertainment with traditional song and dance performances by your graceful hostess. Make the best of the great photo ops for the folks back home, as you experience a charming afternoon, reminiscent of an era long departed…. (Half Day; Time of Day: Afternoon; Duration: 2 hrs; Private Activity & Transfer; Meals included: Tea & Refreshments; Fitness level: Easy; Please bring comfortable walking shoes and cameras). Kurashiki is a charming city in the Okayama Prefecture facing the Seto Inland Sea, and embracing the banks of Takahashi river. With a bustling modern center and an old heritage quarter, the city beautifully blends the best of the old and the new. Discover the lovely town of Kurashiki. This major trading town dating back to Japan’s Edo period, is today a prosperous amalgamation of traditional Japanese and modern global influences. 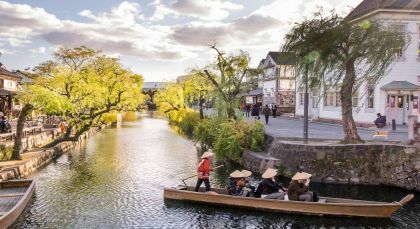 A one hour ride from Hiroshima on the Shinkansen bullet train will take you to Kurashiki, which is reminiscent of Italy’s Venice with its small boats sailing on the Kurashiki River. Visit the Bikan Quarters, marked by an old canal lined with willows and old warehouses in the center of town. Most of the town’s old feudal trading houses have been converted into museums, cafés and shops. Interact with local artisans and learn more about their works of art. Drop by the Ohara Museum of Art, which is the oldest private collection of Western art in Japan, and also displays contemporary Japanese art. (Half Day, Fitness Level: Easy; Please bring comfortable walking shoes). Hiroshima evokes powerful images and emotions attached to its war-torn past. Yet today, Hiroshima has emerged as a symbol of peace, beauty, and hope. All airport, train station and hotel transfers as indicated. For private transfers our representative will meet you at the airport or the station and accompany you to your vehicle (and vice versa).